After the first rest day of the Giro, the first of the proper mountain stages will test the riders that are hoping to make an impact. The first 70km are pretty flat and there is an intermediate sprint at the 81km mark. 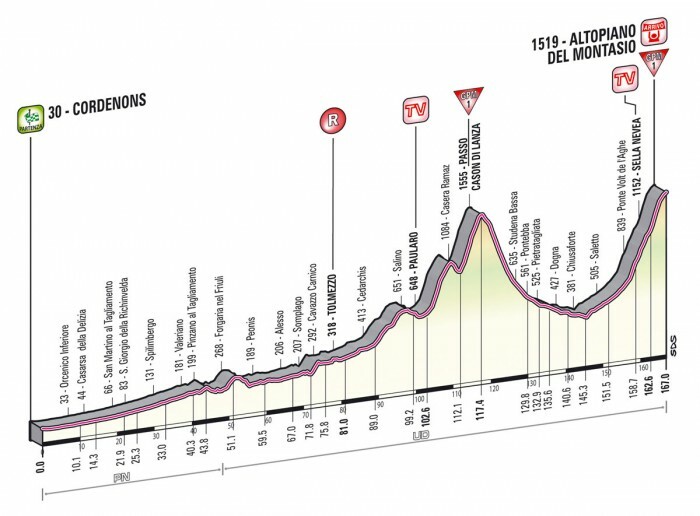 After that, the first of the big climbs of the day up Passo Cason di Lanza will shed plenty of the peloton. Anyone that is not too far back might have a chance to get back into contention on the long descent, but the final climb to the summit finish at Altopiano del Montasio will whittle it down to the elite climbers. It will be interesting to see whether a breakaway is allowed to go all the way and win this stage. While Astana have a strong team, it is tough to hold the leader's jersey for two weeks, so they may be happy for a breakaway rider to take over the jersey until later in the race. Again, we have two potential scenarios for this stage - a breakaway winner or a battle between the GC contenders on the final climb. Stefano Pirazzi will almost certainly be in the breakaway to begin with as he looks to pick up more mountain points on the Passo Cason di Lanza. It would also be little surprise to see at least one Colombian in the breakaway. John Darwin Atapuma was quietly fancied for the climber's jersey, but has been quiet so far. However, now the inclines ramp up and the altitude increases, I would expect to see him coming into his own. I suspect though that a breakaway will not stay away and it will come down to the bigger names. 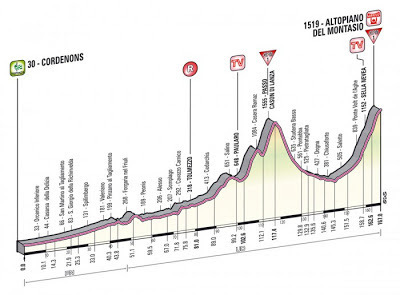 There are some incredibly steep sections of the Altopiano del Montasio, starting at 14% and getting up as high as 18.5%, providing the perfect springboard for an attack. The bigger climbers might not enjoy this stage and the likes of Wiggins, Gesink and Hesjedal will probably be happy just to hang on and might even lose some time. Instead, this will be where the smaller climbers excel. The likes of Vincenzo Nibali, Michele Scarponi, Cadel Evans and Mauro Santambrogio will be eyeing up the chance to put their challengers under serious pressure. However, one rider that I particularly fancy for this stage is Domenico Pozzovivo. He would appear to be in good form, given his position in the GC after the time trials, and could well be eyeing up a stage win. It would be no surprise to see him attack at some stage on the final climb and push away for the victory. Another rider that it is worth keeping an eye on is Carlos Betancur. He is a little way back in the GC, so could be allowed to go away, and he will be looking at this as a chance to propel himself up the rankings and maybe target the young rider's classification. He showed in the last stage that he is in good form, and although this will be a tough challenge, if he is in top form, he is capable of winning this solo. I would also not be overly surprised to see Franco Pellizotti attack on the final climb if he is feeling good. He has been targeting this stage as he was born and lives in the area, so knows the climb as well as anyone in the peloton.